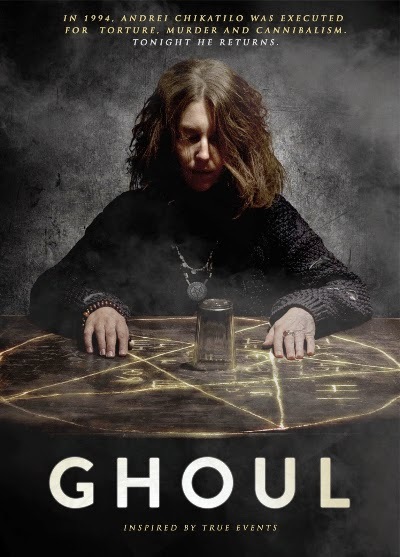 GHOUL follows three Americans who travel to the Ukraine to investigate how cannibalism swept through the country during the notorious famine of 1932. After being lead deep into the vast Ukrainian forest for an interview with the last known survivor of the cannibalism epidemic, they are plagued with a series of unexplainable supernatural encounters and come face to face with the evil spirit of Andrei Chikatilo, who was born in the Soviet Union and was the most violent serial killer and cannibal of all time. Last edited by mike727360; 03-03-2015 at 01:28 PM. Vega Baby Releasing has announced today that the film GHOUL will be available on VOD and DVD starting June 23, 2015. After filming in the Ukraine, the frightening flick opened #1 in the Czech Republic and went on to become the highest grossing horror movie in Czech history, followed up by a limited U.S. theatrical release in March. GHOUL was written and directed by Petr Jakl and produced by J.B.J. Film. Rob Cohen (director, The FAST and the FURIOUS), Joe Lynch (director, EVERLY) and Luke Rivett are Executive Producers. Nancy Bishop and Frantisek Vondracek served as Co-Producers. Vega Baby Releasing previously distributed the high-profile documentary THE MAGIC of HEINEKEN, which made an exclusive run on Hulu before heading into select theaters and a multi-platform release late last year. Read the Matchflick Review HERE.